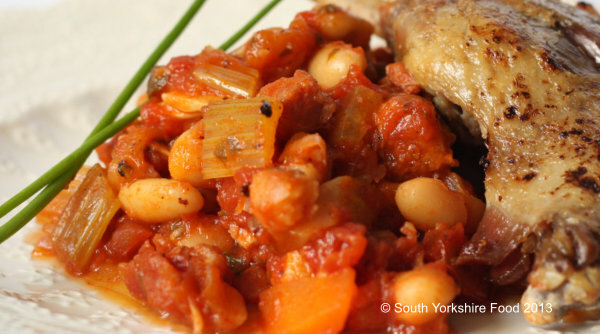 This is a lighter version of the traditional cassoulet which contains bigger sausages and usually duck, goose, or chicken. Although it is lighter it still packs bags of flavour and is just as satisfying. Serve it as a light lunch with crusty bread bread or as a side for confit duck or grilled chicken. Serves 4-5. 400g tin of white beans - cannellini, haricot, butter beans - your choice. We used cannellini beans. In a non-stick sauté pan, cook the pancetta lardons over a medium heat until they are crisp. You should not need any extra oil as the fat coming out of the lardons will be enough to crisp up the lardons. Spoon the crisp lardons into a bowl with a piece of kitchen paper on the bottom to absorb any excess fat. In the same pan cook the chipolata sausages until they are browned all over. Add these to the bowl with the lardons. Remove all but a tablespoonful of fat from the pan, and in this remaining fat gently cook the shallots and garlic over a low heat until the shallots are translucent. Raise the heat to medium-high and pour in the vermouth. Scrape up any pan residue and cook for 1 minute to boil off the alcohol. Now add the beans, tomatoes, and stock, and the sausages and lardons. Mix well, season with salt and pepper. Cover and simmer over a low heat for 25 minutes, giving it a stir every now and then. If the sauce is a little thin, remove the lid and cooked on a higher heat until it is reduced a little, and thickens slightly. Finally, adjust the seasoning to your taste. Serve on its own as a light lunch with some crusty bread, or as a side dish for confit duck or grilled chicken.